Local and Online Camera Shop with great prices! Andrew has opened a gallery in Criccieth. 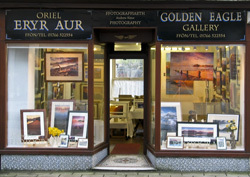 Oriel Eryr Aur / Golden Eagle Gallery, (the shop has been known as the Golden Eagle for at least four generations), at 42 High Street, Criccieth, displays a wide range of Andrew's work in print and on canvas. Colin Evans a native of Bardsey, runs fantastic boat cruising trips to explore his beautiful island home. www.annesmithglassdesigns.co.uk Beautifully designed stained glass. http://www.cegingrug.co.uk/ Mobile catering for any function. http://www.tryfan-rhiw.co.uk Holiday Cottage in Rhiw. If you think your website should be listed here, please let us know. Please visit this website, but better still donate some of your hard earned cash. These good people do a great job, and save countless lives in rural Wales each and every year. A new website about the Porthdinllaen Coastguard Rescue Team. A group of local volunteers that give their time to rescue those in difficulties around our coast. www.gwesty-tynewydd.co.uk The Ty Newydd Hotel, at Aberdaron is the place to stay on Llŷn. www.cardiau-llyn.co.uk A new local website with beautifully designed cards for all occasions. www.traedmoch.com Local pork products, farmers and suppliers. http://www.aberdaronlink.co.uk/ Website of the Aberdaron & District Tourist Link. 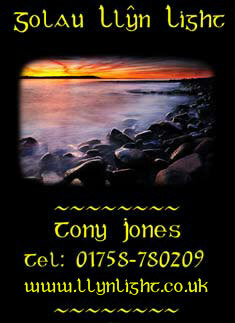 http://www.nefynholidays.co.uk/ Llyn Peninsula Holidays Agency. http://www.harlechmc.co.uk/index.htm Harlech and district Motor Club. http://www.abersochboatyardservices.co.uk/ Abersoch Boat Yard. The place for all your yachting needs. Large stock of marine spare parts, and the best in the area for Marine clothing. http://www.richardbufton.co.uk/ Local marine electronic, and diving specialist. http://www.geginfawr.co.uk Aberdaron's famous Cafe, under new management. http://www.llanbedrog.com Website for Llanbedrog, one of the largest villages on Llyn. http://www.cimwch.com All you ever wanted to know about Lobsters and fishing, plus some great photos. http://www.caneuongwerin.co.uk Fine selection of Welsh folk songs and poetry. http://www.jamesawilliams.co.uk James is a brilliant Artist, with a varied folio including local seascapes. http://www.oriel.org.uk/ Plas Glyn y Weddw, Llanbedrog. Art Gallery, see Wales's finest artists. http://www.llyn-wales.co.uk Lots of stuff about the Llyn peninsula. http://www.llyn.info/ Where to go in Llyn. http://www.penllyn.com All you will ever want to know about the Llyn Peninsula. http://www.saintdavidssociety.org/index.asp Beautifully presented website from across the pond. http://www.ianscott-taylor.com/ Ian is a local man that now designs Golf Courses in the States, a must website for any keen golfer. http://www.golwg.com Topical Welsh language magazine.